In Chinese baobao means precious treasure, and babies are called baobao to reflect how dearly beloved children are. In the photo above is a Nan Haidz, a boy, with his dad, participating in a tradition from his ethnic culture. His robes are bright red, with colourful embroidery, a serious ecpression on his face as he concentrates. 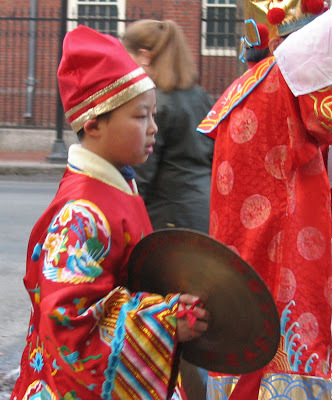 He has cymbols, and clashes them to make a wonderful if exotic to my ears sound. Wu Zi, or year 4705 on the Chinese Calendar is also known as the year of the Rat. 2008 is the 7th year in the current 60 year cycle. 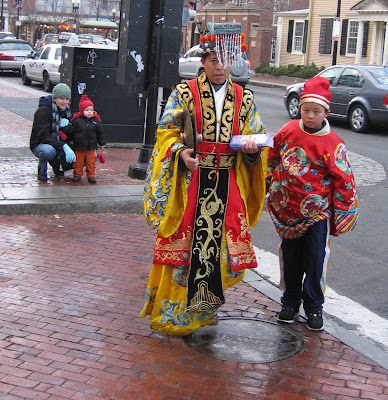 The Chinese calendar is based on both solar and lunar cycles, and is interesting to study. 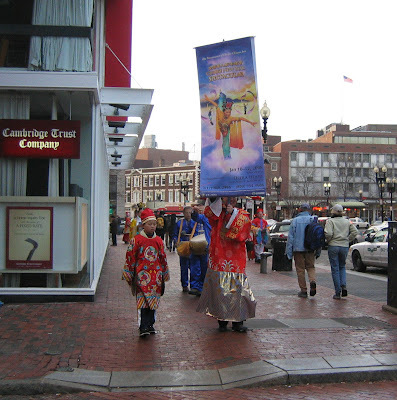 Some folks call this Spring Festival. 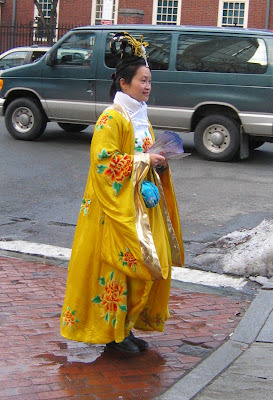 This lovely beauty sports a classical hairdo, which we saw displayed in Xian, when we visited in 1989. We also enjoyed black rice and wine. Women's lives have changes over the centuries in China, and the first law passed after Mao established the People's Republic of China and declared "The Chinese People have stood up," was the Marraige Act. Thanks to Soong Ching Ling's vision, women have equal rights in China today, and children go to school. 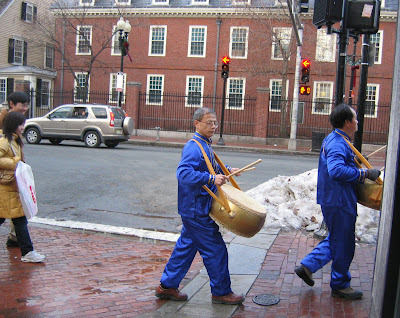 I love this photo, showing both modern and traditional Chinese, the men with the drums are born in America American, and the folks in modern dress are born in China Chinese! How ironic! That shows that connection to one's cultural identity need not be lost because one moves to another land. I hope you all will add to this, leave your comments, we would all like to learn more about Chinese New Year's celebrations.